Northwest Las Vegas has seen a huge surge of development in the last 10 years. This area is bound by the Spring Mountain range to the west and the Sheep Mountain range to the north. It is very popular as it is a little more affordable than Summerlin and the Southwest area of town. Popular communities are Providence, Desert Shores, Painted Desert, Centennial Hills and the new Sky Canyon which is still being built. A newer master planned community started in the mid 2000’s in the northwest close to the Spring Mountain range with easy access to the 215 Beltway. This is a family oriented community with parks, tree lined streets and planned family activities. Properties range from starter homes to six bedroom homes in gated neighborhoods. There are 36 neighborhoods and approximately 7000 homes. Nearby restaurants include Divine Eatery, Market Grille Café, and Mimi’s Café. The tree lined streets and family atmosphere. That residents get out and walk and the flocks of ducks that make this home. A guard gated golf course community built between the late 80’s and late 90’s. 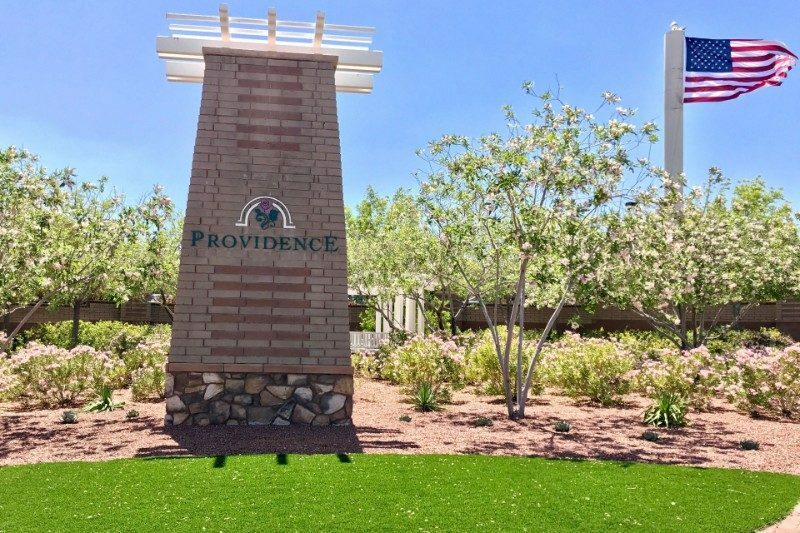 One of the most affordable golf course communities in Las Vegas it features condominiums and duplex villas to single family home and custom homes. It also has an active tennis group with four lighted courts. Painted Desert has easy access both the 95 and the 215 Beltway and is adjacent to the Centennial Hills shopping area with fitness gyms, Trader Joe’s, Home Depot, etc. Of the many nearby restaurants these are some of my favorites: North Beach Italian Bistro, Moo Woo Korean BBQ, and BJ’s Restaurant. The location and mountain views. A broad area, 54 square miles, of the northwest Centennial Hills has its own hospital, a fantastic community center, many shopping areas, wonderful parks including historic Tule Springs and Gilcrease Orchard where you can pick your own fruit and vegetables. This area has a rural feel as there are many properties on large lots starting at one half acre and going up to 100 acres. There are also production homes and a wide variety of neighborhoods. Restaurants in this area include Leticia’s Mexican, the historic Bob Taylor’s Ranch House, and Lemongrass and Lime Thai Bistro. The open and rural feel of the area. Is the newest master planned community in the northwest. It is very close to the Spring Mountain range and the Kyle and Lee Canyon recreational areas. New construction is currently available there with Pardee, Pulte, Woodside, Century and Richmond American builders. Please contact me for up to date information on this newest community. It’s emphasis on fitness and bringing the outdoors inside.